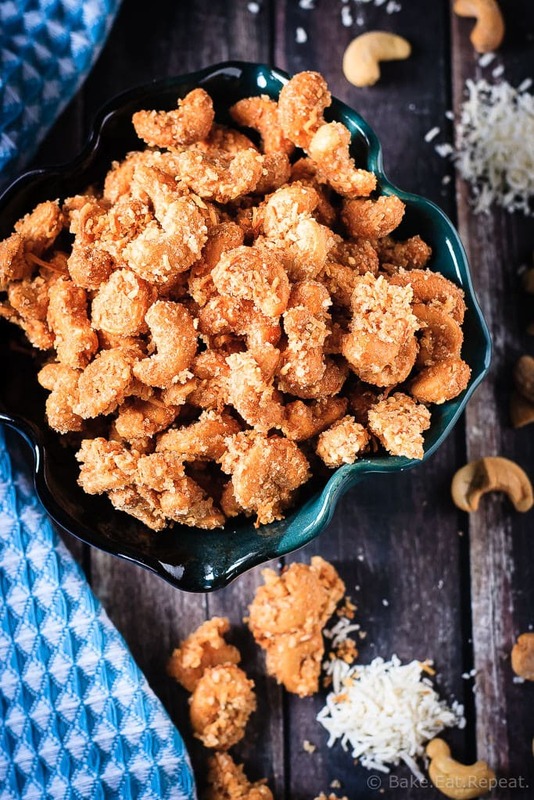 These candied coconut cashews are completely addictive. So good that you will not want to stop eating them until they’re gone. And then you have to make more. These coconut cashews are insane. In a good way. 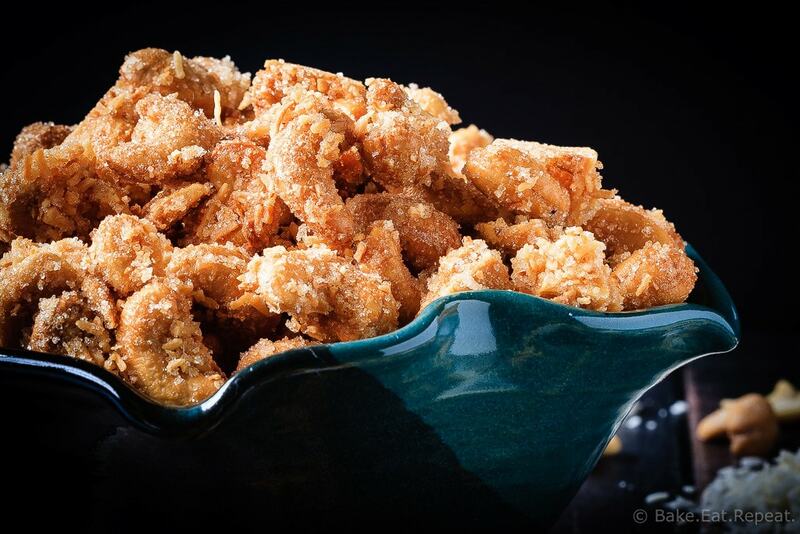 Have you tried those candied coconut cashews that they have at Costco now? Oh my goodness, those are amazing. My husband is completely and totally addicted to the things. They’re entirely impossible to stop eating. So…..maybe I shouldn’t have figured out how to make them? Perhaps. But – now I can share the recipe with all of you, and you can be addicted with us! Doesn’t that sound like fun? It does. They’re delicious. You can’t really not like them. Unless of course you don’t like coconut or cashews. But then, if that’s the case, you probably aren’t still reading this because clearly you’re not interested. Also, I don’t really understand how you can’t like coconut or cashews. They’re amazing, everyone should like them. These coconut cashews are super simple to make. You toss the nuts with a beaten egg white, and then toss the coated nuts with some sugar and coconut and bake them for a while. So simple and delicious. These literally take about 5 minutes to get into the oven. That’s almost faster than grabbing the container at the store. Okay, not really. But the point is they’re really fast and easy to whip up and anyone could do it. There’s not even that many ingredients. So simple. These coconut cashews are the perfect little snack or treat. Or a fantastic gift. If you don’t eat them all before you manage to give them away that is. But, if that happens, it’s okay. They’re so simple to make, you can just whip up a second batch to give away. Make them. Coconut cashews are amazing. In a large bowl, mix together the granulated sugar, coconut and salt until well combined. In another bowl, whisk together the egg white and vanilla until frothy. Add the cashews to the bowl of frothy egg whites and toss until the nuts are completely coated. Then pour the coated nuts into the bowl with the coconut and sugar mixture and toss until they are well coated. Pour the nuts onto the prepared baking sheet and spread them out evenly. All the coconut mixture won’t stick to the nuts, it’s okay, just pour it onto the baking sheet with the cashews and most of it will bake onto the nuts in the oven. Bake for 1 hour and 15 minutes, stirring once or twice. Allow the nuts to cool completely on the baking sheet. Store in an airtight container at room temperature for 2-3 weeks. Source: Adapted from my cinnamon sugar almonds . These look so yummy but I can’t do eggs. Is there something I can use in its place? Maybe coconut oil? Hi Hanna - I'm sorry but I really don't know what you could use instead of the egg here - you could try coconut oil, but I have no idea if it would work the same in this recipe or not! Sorry! Costco stopped selling these over a year ago and I've been missing them hugely ever since. They recently introduced a Kirkland branded chocolate/coconut/cashew blend that is woefully inferior. Thanks so much for posting this! I KNOW I'll love them, maybe even more than the original Costco version since I can tweak it. Yeah, these aren't exactly the healthiest of snacks - I don't let myself make them too often! I have never actually used coconut sugar at all so I can't say whether it would work in these, but it's probably worth a try. My other thought is you could probably use more nuts for the amount of coconut/sugar coating if you want to cut down on the sugar per cashew. I haven't made them in a while, but I think there was a lot of coating on each cashew and they'd probably be fine with a bit less. Let me know if you try either of those options! So I just made them and barely any of the coconut stuck to the cashews, any suggestions? Not sure what I did wrong. Still delicious though! I'm not sure - I know the coating doesn't all stick to the nuts but most of it did for me. I did make sure to whisk the egg white until it was really thick and frothy, and I stirred the nuts quite gently while they were baking. Maybe stirring them too vigorously? Or not letting them cool completely before removing them from the baking sheet? Hope that helps! Try grinding the coconut a bit in a food processor first before stirring it in the sugar. Smaller pieces should adhere better. That's a great idea Mary - definitely trying that next time! I love cashews but have never had them with coconut, but it's a combination I know I can easily become addicted to. It looks delicious! Coconut and cashews seriously belong together. So, so good! Thanks! What? I've never heard of this before. This looks and sounds delish! I can't wait to make this myself and I love that it's so easy to do! They're super easy - I love that and hate it cause it's super dangerous when something like this is so easy! :) Thanks Connie! These look wonderful and very addicting. Can't wait to try! Very dangerous, but that's okay occasionally right?! Thanks Cathy! A few people have said that, although I've never had theirs. These were pretty awesome though, hope you like them! Thanks Ashley! Thanks Cali! Hope you like them! I could get into some serious trouble with these! Nonstop snacking for sure! I know right?! Just make small batches! :) Thanks Ashlyn! These look absolutely addicting! I haven't tried the nuts at Costco but I'm so glad you shared this recipe so that I can create them at home!! Oh my gosh, I love the coconut cashews from Trader Joe's but had no idea they had them at Costco! These look incredible, Stacey! I could easily snack on these all day long! <3! You're the second person to mention the TJ's ones - I really wish that store was here! Although maybe it's good that it's not! :) Thanks Kelly! Whoa! These would not last long in my house - whether costco bought or homemade! They look fantastic! They really don't last long, oh well! :) Thanks Rachelle! These look simply amazing. Coconut + cashew is a genius move. Never tried anything like that, but these caches look awesome! Pinning! Thank you for bringing us along on your coconut cashew ride! I'm in! Haha, they're amazing! Thanks Annie! I will try to remember to look for them next time I go to the store and share the brand with you. Super super YUM! Coconut cashews looks and sounds so much FUN! They have them at COSTCO? OMG. That's dangerous. I've only had the ones at Trader Joe's and I can't even buy them. Now I can make them at home...!!!! Pinned! Yeah, it may actually be MORE dangerous to be able to make them. I've already made two batches - although that was mostly because I'm an idiot and figured I'd remember exactly what I did without writing anything down. Evidently I did cause the second batch was just as good, but I really wasn't positive when I went to write up the recipe! You'd think I'd learn! Thanks Dorothy - and thanks for pinning! Ohhhhh geez. There is no way that I would ever be able to stop eating these cashews. Stacey, they look insanely addicting! Oh boy - definitely an addictive factor going on here! I buy a coconut popcorn that is similar - sweet and amazing! I may have to try these nuts. Coconut popcorn?! Now that sounds amazing - I think I know what I need to try to make next, I've never seen that! Thanks Lisa! Oh this looks like a snack that I would definitely become addicted to! Love the coconut flavor, Stacey! I think I could snack on this all day long. Love how easy this is to throw together, too! These look really dangerous, Stacey! Which makes me want them even more. ;) Seriously, these look so good. And I'm sure they don't last long! So dangerous, but yes that usually means it's a good snack! :) Thanks Mir! looks like the perfect sanck Stacey! :) I love cashews + coconut so we can always be friends! :D Pinned! Glad to hear it Manali! :) Thanks! I'm not a big cashew fan (I know!!) but I bet I could use pecans to make this!! Good thing I LOVE coconut! I'm sure it's be great with pecans too! Thanks Beth! I love coconut so I could see myself eating all of these! Yeah, they're hard to leave alone! :) Thanks Deb! i never use silly abbreviations like omg, but omg. this is an amazing idea and i'll be trying it immediately!! Thanks so much Grace - hope you like them! I know right? I was so annoyed every time my husband came home with more of them, and now I've just made things worse by discovering how easy they are to make! But smaller batches are definitely a little less trouble then the big tub! :) Thanks Andi! 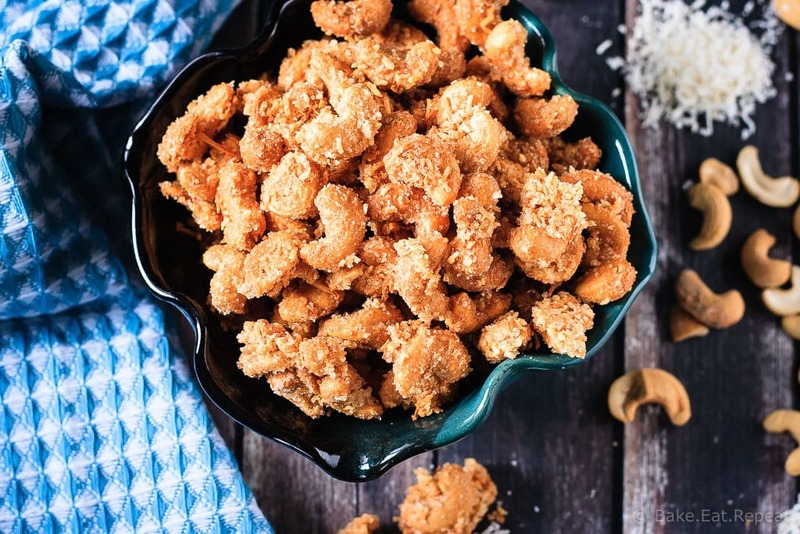 I love both cashews and coconut, so I'll definitely be trying these! Thanks Renee! Hope you like them! Yum Stacey!! I've never had coconut cashews before. I think I am missing out!! These look awesome! :-) Pinned!! You totally are - they're fantastic! Thanks Cyndi! I adore coconut AND cashews, so we can def be friends! Hahaha, glad to hear it! :) Thanks Dorothy!